We’ve made lentil bolognese many ways over the years, but we keep coming back to red lentils being our favorite kind for this application. The tricky part with red lentils is that they turn from perfect consistency to mushy in literally a second if you don’t watch them closely – which is why we like to put them in the thick tomato sauce from the beginning, where they take longer to cook and thus are easier to control (as opposed to boiling them separately in water and adding them in later on, which is a common method). Not holding back on the tomato paste is another thing we’ve picked up – it gives the sauce that rich, creamy flavor and texture that will have you come back for seconds (and thirds). Another piece of old news – in addition to us being into big batch-cooking – is that red lentils (as all its legume cousins) hold a massive amount of macro as well as micro nutrients. Where to begin? Fiber, protein, slow carbohydrates. Phosphorus, iron, folic acid, B1, potassium. The list goes on and on. As you can see, if you scroll down to the nutritional information for this meal, this dish really is a great one for athletes needing easily accessible energy and a generous amount of protein. And before we let you go make this – a note on essential amino acids. It seems some people think each meal has to contain all the (9) essential amino acids for us to not end up with a nutritional deficiency. That’s not the case at all. The concept of essential amino acids is simple – these are the ones we have to get from our diet, because the body can’t produce them itself. But as long as we get adequate amounts of them all over the course of a 24-hr period, you need not to worry. Most of the time though, your (plant based) meal will provide you with the whole group of essentials anyway, because we usually don’t eat just ONE thing. 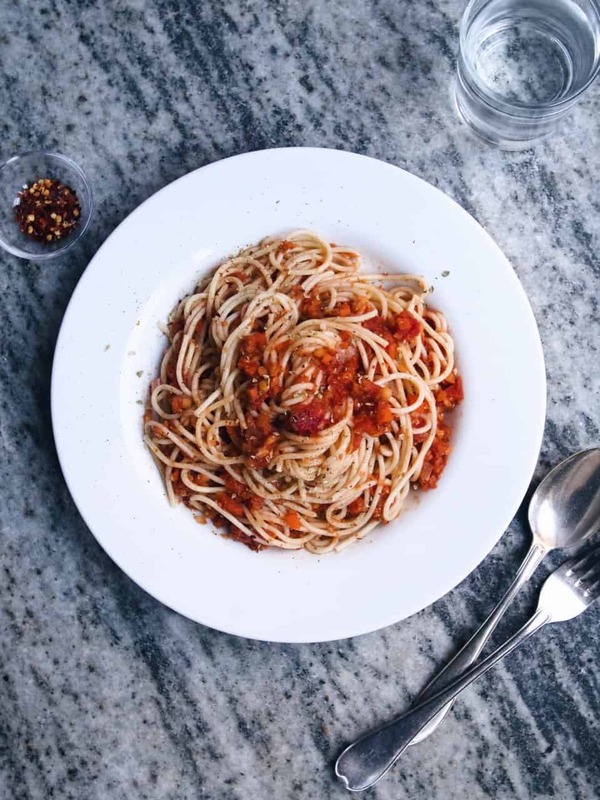 You have your lentils with pasta (such as here), for example, which means you’re getting methionine (the essential amino acid missing in lentils) from the pasta (methionine is abundant in grains). So worrying about getting enough essential amino acids – provided you’re eating a varied plant based diet – is not necessary. Ok? Now, go cook this and tell us what you think! Sauté onions and carrots in 2 tbsp olive oil and 1/2 tsp salt in a large pot over medium heat, approx. 3 min. Add in the garlic, and continue cooking for another minute or so. Then add in 1 more tbsp olive oil and the lentils, and give it all good stir. Let it cook for a few more minutes, stirring frequently. Add in crushed tomatoes, bouillon powder (or cube) and about half of the water (tip: rinse out the tomato containers and use that water). Stir. Lower the heat to a simmer, add in the tomato paste, and then let cook for about 30 min, or until you like the consistency of the lentils. Add in the rest of the water bit by bit, and stir often. In the meantime, cook pasta according to package instructions. When lentils are done, turn off the heat. Stir in sugar, oregano, a pinch of red pepper flakes and a good grind of black pepper. Season to taste with salt. We usually add 1/8-1/4 tsp more, but this will depend on the bouillon used. Serve pasta topped with the bolognese in big bowls. Finish off with more red pepper flakes and/or black pepper if that’s up your alley, and enjoy! Nutritional information (based on 6 servings): Protein: 30 g, Carbohydrates 103 g, Fat 10 g, Energy 622 kcal. Fräs lök och morötter i 2 msk olivolja och 1/2 tsk salt i en stor kastrull på medelvärme, ca 3 min. Tillsätt vitlöken, och stek tillsammans i någon minut. Tillsätt därefter ytterligare 1 msk olivolja och linserna, och rör samman alla ingredienser ordentligt. Låt detta steka vidare ett par minuter, medan du rör ofta. Tillsätt krossade tomater, buljongpulver (eller -tärning) och ungefär hälften av vattnet (tips: använd vattnet från när du sköljer ur tomatförpackningarna). Rör om. Sänk värmen till låg, tillsätt tomatpurén och låt sjuda i ca 30 min, eller tills dess att du gillar konsistensen på linserna. Tillsätt resten av vattnet allt eftersom det behövs, och rör ofta. Under tiden, koka pastan enligt förpackningens instruktioner. När linserna är klara, stäng av värmen. Rör ner socker, oregano, en nypa chiliflakes och generöst med svartpeppar. Smaka av med salt. Vanligtvis tillsätter vi 1-2 krm mer, men det beror på buljongen i fråga. Servera pastan tillsammans med såsen i stora skålar. Toppa med mer chiliflakes och/eller svartpeppar om det är din grej, och njut! Näringsinformation (baserat på 6 portioner): Protein: 30 g, Kolhydrater 103 g, Fett 10 g, Energi 622 kcal. Made your granola bars today, the honey from our bees here is liquid, so no warming up and that keeps the good stuff in the honey. We sampled a small piece and liked it. Yesterday was minestrone day, substituted parsnips for rutabaga and had tomato juice (from pasta sauce made of non paste tomatoes) as a base. Half was still big for us, so the rest is in the freezer. We like your recipes, good tasting and not fussy. Fun! Glad you liked the bars. We often have liquid honey around as well – makes it even easier! And we’re so happy to hear you like our recipes. As far as the serving sizes, well, we’re big eaters! All those miles on the trails, you know 🙂 Wishing you a lovely Sunday!